I purchased this to replace my Holmes humidifier I'd had for many year's. I'm very happy with it. My only complaint would be the indentation handle is difficult to hold onto to sit it back on base after refilling. Just have to be a bit careful with that. 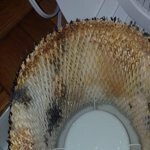 I've seen comments about a moldy filter,, that has nothing to do with the humidifier itself! Empty it if your not going to use it regularly, if not the water sitting in the filter will eventually mold the filter. That WILL happen with any humidifier you use. It was time to replace my bedroom humidifier that was over 15 years old and no one made the wick filters to fit it any longer. Living in the Midwest just 4 miles from Lake Michigan the winters can get very snowy, cold and dry. I have had sinus problems almost all my life and have to have a good working humidifier in my bedroom and also the house. I had reservations about this Sunbeam Cool Mist since the price was so low but am sure glad I took the chance! This little baby puts out over 3/4 of a tank a day now in October on the low setting, I believe the tank is 1 gallon. One feature it has that I didn't realize at the time of purchase is a small wheel type dial under the speed control setting that allows you to "dial" in the month your in. I'm still not sure if that is for water flow or just a "gadget" that may or may not change the way it works but have it set now on "Oct" and its working great. There are 2 speed setting on this unit and it uses a oval type wick filter (see which I purchased below). This makes all the difference in the world to me when I sleep and especially when I wake up, no more sinus pain :)! Do yourself a favor and order some extra filters at the same time you order your humidifier, the filters I ordered where from here at Walmart item - Sunbeam SF212PDQT2-WM Humidifier Filter, 2pk and be set for the entire season. 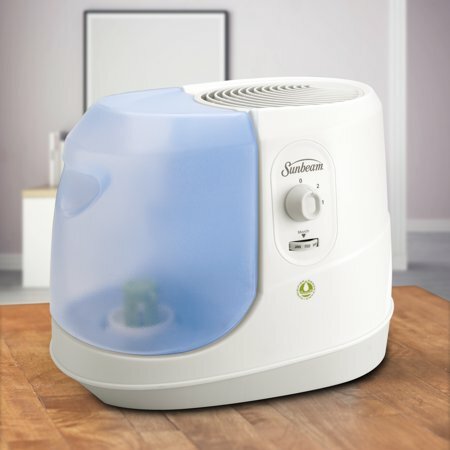 Oh and by the way they do sell some type of "scent tablet" that you can put in the humidifier I guess for aroma therapy if you are so inclined, I just put a $1 twist open room freshener on top of the unit and it works great that way lol. Very suprised it came with filter with the unit. It's very quit, not loud like some of reviews said number 2 setting, it no louder then a small fan on low setting. Puts just enough moister in my son room. My only issue was when taking filter out the base just sits back on and does lock other then that it works great. I purchased this for a room I store and play musical instruments in. I try to keep it at 50% humidity. This winter the humidity dropped very low and the old humidifier wouldn't keep up with the dryness. This model has served well for months, no problem I can usually keep the unit on low, moving to high only to bring the level of humidity up if I have shut it off. This humidifier works well in my large living room - dining room area. It puts out a good deal of moisture (to judge by how quickly the tank empties) and the fan disperses it well, with no residue. It's quiet and unobtrusive. It misses five stars because the filter system requires regular replacement, i.e. ongoing new purchases. I've bought the no-filter kind before and liked them too, however this type does put out more moisture more efficiently. Since the filter is just a wicking substance held in place by a plastic mesh, I may experiment and see if a cloth rag filter serves the purpose as well as the existing filter does. But even if I have to buy replacement filters, it's a good, inexpensive, workable machine. Good price, and it works, BUT nowhere on this page are we told that it requires a new filter every month at $8 a pop, or 'enhancement' tablets every refill (no tablets are included with the product). I think Walmart should let potential buyers know when there will be expenses like that. I am somewhat disappointed with how this product worked I used it in my bedroom at night, I only felt the cool air from the fan no moistuer whatsoever. I didn't get the results I expected which was relief from the dryness in the air due to home heating, not sure if this is the way this humidifier is suppose to work or if there is some sort of malfunction in the system but my sinuses didn't feel any better from it. 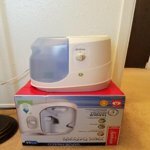 I bought this item at a Walmart store I have been using the humidifier for 4 weeks. It does not release a mist at all. I know that the filter is supposed to turn orange/ish when is time to change it. However, this morning I woke up with a bloody nose so decided to check the filter. To my surprise I saw black mold. I am attaching a picture. Do not buy this item. I will be trying to return this. Although this humidifier is quiet, it had to have a smaller motor and fan blades to achieve quietness. That's the reason one gallon of water will last 24 hours. It does not achieve the same level of humidity as the older, larger Sunbeam humidifier we have in the bedroom. So far, the fan doesn't rattle like the other old one it replaced. The handles are formed into the translucent tank, making it awkward to handle. A handle on top might have worked better--like the older, larger units. The fill cap is large and difficult to seat properly to screw it back on the tank. The instructions have information about some kind of tablet to put into a cage on the bottom of the fill cap, but that information was not in the description of the unit on Walmart's website. The box included no tablet sample. I think the tablets have to be ordered directly from Sunbeam. Finally, the instructions call for completely emptying and cleaning this unit daily, a time-consuming chore I would reserve for my enemies if I had some.